Habit: Perennial herb in soil on rock crevices; rhizome short- to long-creeping. Leaf: spirally arranged, short-spaced or distant, 5--40 cm, +- alike; stipe firm or fleshly, with 2 vascular strands, often expanded at base ("trophopods"); blade 2--3-pinnate-pinnately lobed, thin-herbaceous, broadest at the base or lanceolate, veins free, extending to leaf margin. Sporangia: sori round, with hood-like indusium arching over sorus [naked (Gymnocarpium)]. 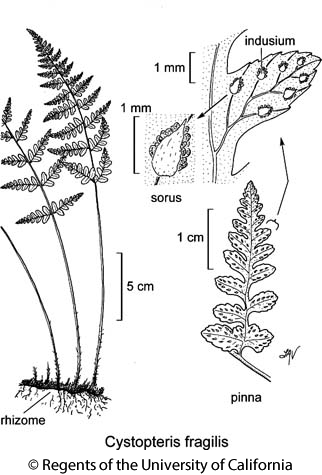 Genera In Family: 3 genera, +- 37 species: Cystopteris and Gymnocarpium widespread north-temperate (Cystopteris south through Andes, Africa, Australia, New Zealand); Acystopteris southeast Asia (Rothfels et al. 2013 Syst Bot 38:295--306). Unabridged Note: Polyploidy, often accompanied by hybridization (allopolyploidy), common; many widespread species represent complexes of allopolyploid lineages (Rothfels et al. 2014 Taxon 63:1026--1036; Rothfels et al. 2016 New Phytol in press). Outlying (sister) family to remainder of the large eupolypods II clade (suborder Aspleniineae; Pteridophyte Phyogeny Group 2016 J Syst Evol in press); only distantly related to Woodsiaceae, where often included (Smith et al. 2016 Taxon 55:705--731). Scientific Editor: Bruce G. Baldwin & Thomas J. Rosatti. Habit: Rhizome generally short-creeping. Leaf: stipe +- fleshy, often with few scales, base ×-section with 2 vascular strands; blade 2--4-pinnate, pinnae sides unequal, acroscopic pinnules more spreading, larger, more incised; veins free and extending to leaf margin. Sporangia: sori round; indusia hood-like, arched over sorus, attached on side away from margin, often obscure in mature sori. Unabridged Note: Often confused with Woodsia (pinnae sides equal; more fragmented indusia encircling sorus base; veins ending before leaf margin). Species limits, especially in the Cystopteris fragilis complex (sensu Rothfels et al. 2013 Syst Bot 38:295--306), obscured by hybridization and polyploidy (Rothfels et al. 2014 Taxon 63:1026--1036; Rothfels et al. 2016 New Phytol in press). Habit: Rhizome 2--4 mm diam; scales at tip, lanceolate, +- brown, shining, glabrous, entire. Leaf: 8--30(37) cm; stipe generally < blade, < 1.5 mm wide, glabrous, base straw-colored to red-brown; blade generally 10--24 cm, 3--9 cm wide, lance-ovate, lowest 2--4 pinnae +- < others. Sporangia: indusia generally +- white. Chromosomes: 2n=168. Ecology: Shady, moist rock crevices, meadows, streamsides; Elevation: 50--4100 m. Bioregional Distribution: KR, NCoR, CaR, n&c SNF, SNH, Teh, SnFrB, SCoR, n ChI (Santa Cruz Island), TR, PR, GB, DMtns; Distribution Outside California: worldwide. Note: Highly polymorphic; Californian plants may represent a species complex. Malformed spores produced by some plants, possibly indicating hybridization, polyploidy. Citation for this treatment: Carl J. Rothfels & Alan R. Smith 2016, Cystopteris fragilis, in Jepson Flora Project (eds.) Jepson eFlora, Revision 4, http://ucjeps.berkeley.edu/eflora/eflora_display.php?tid=22182, accessed on April 26, 2019. KR, NCoR, CaR, n&c SNF, SNH, Teh, SnFrB, SCoR, n ChI (Santa Cruz Island), TR, PR, GB, DMtns; Markers link to CCH specimen records. Yellow markers indicate records that may provide evidence for eFlora range revision or may have georeferencing or identification issues. Purple markers indicate specimens collected from a garden, greenhouse, or other non-wild location.